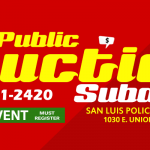 The City of San Luis Police Department Auctions are open to the public. The city has auctions at least once a year. Auctions are announced 30 days prior to the event. All vehicles are sold “AS IS, WHERE IS” and with all faults. Seller makes no warranty or refunds. Vehicles are sold in an open competitive bid auction. The highest bidder is the buyer. The auctioneer reserves the right to reject any bid or stop the sale of a vehicle. In the event of a dispute, the auctioneer’s decision will be final. To register, visit the San Luis Police Department at: 1030 E. Union St. San Luis, AZ. Registration is Free. Registration closes before the beginning of the Auction. Must Bring: Must have a valid driver’s license or valid state identification card with date of birth. Auctioned items must be picked up within 2 weeks of the Auction. A $25/day storage fee will be charged for items that are not picked up. Preview inspection of vehicles prior to sale day is allowed. No pets allowed (except guide dogs). The sale of City equipment and/or vehicle(s) is in an “AS IS” condition, with all faults and without warranty. The description of the equipment and/or vehicle(s) offered for sale has been compiled from data available. The City does not guaranty or warrant the condition or quality of the equipment and/or vehicle(s). The City reserves the right to withdraw any equipment and/or vehicle(s) being offered for sale. All costs associated with sale of the equipment and/or vehicle(s), including but not limited to loading, freight, insurance, shipping of equipment and/or vehicle(s) and taxes are the successful Bidder’s responsibility. The sale of the equipment and/or vehicle(s) will be to the highest responsive and responsible Bidder. There shall be no refunds or adjustments on the successful Bidders price. All sales are final. The City is not responsible for any omissions, mistakes or errors in the description of the equipment and/or vehicle(s) offered for sale. -The City reserves the right to withdraw any equipment and/or vehicle(s) from the sale up until the time the sale of the equipment and/or vehicle(s) have been awarded to the highest bidder. Award of Sale Item: A legally binding contract is established between the City and Bidder at the time auctioneer awards sale of equipment and/or vehicle(s) to Bidder. The City will pursue any and all legal remedies allowed by law against Bidder if Bidder fails to make any required payments. ALL SUBMITTED BIDS SERVE AS OFFERS TO FORM A CONTRACT.